Kirby: Triple Deluxe was announced so recently, both in its initial reveal trailer and an off-the-cuff reveal of its name following the most recent Nintendo Direct, that we initially assumed it'd be a 3DS title for late 2014. How wrong we were, at least in the case of Japan, with the pink one's new adventure arriving in Nintendo's homeland on 11th January — just over a month away. 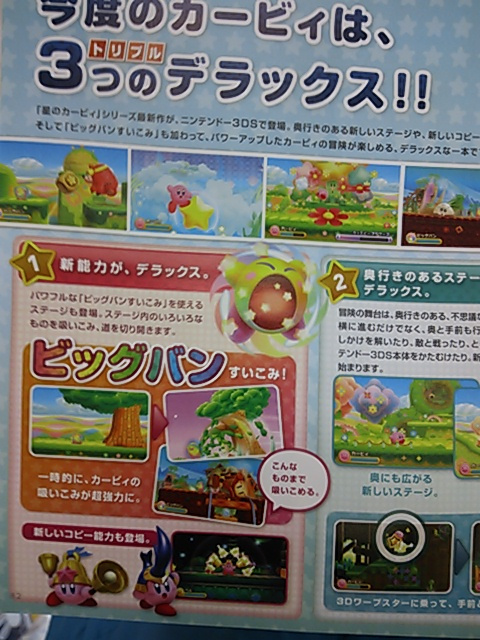 With its arrival so close we can certainly expect to see more footage and screens soon, and though the official teaser site remains unchanged since its launch, some magazine scans have emerged that seem to show some new screens. We can't quite determine the context for all of them, but they are interesting nonetheless. Check them out below (along with a few official screens as a refresher) and, by all means, speculate wildly in the comments section. 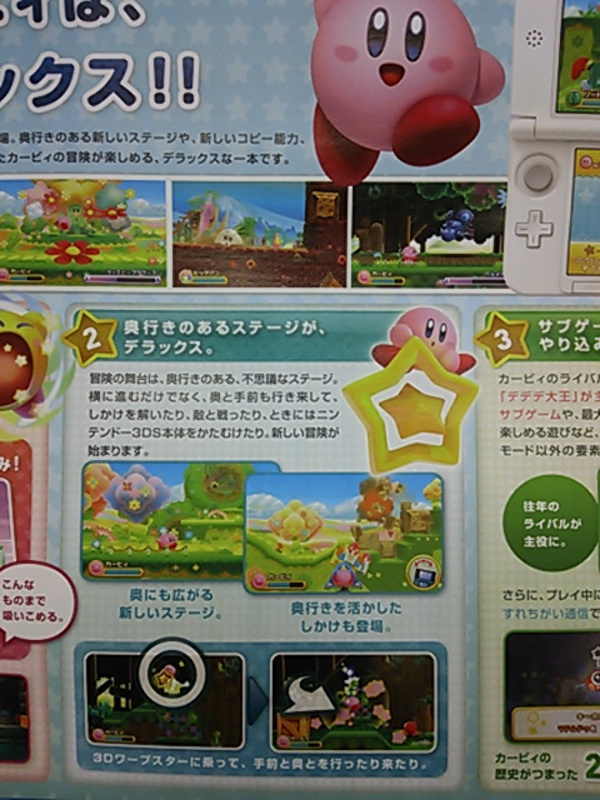 As for us, we're keen to learn more about this one because, well, it's Kirby. Flashbacks to Kirby Mass Attack? Thanks to Owen for the tip. I hope Owen gets a shiny one more easily now. Kirby makes me happy. Such a fun and interesting series. Sweet! I can't wait! I'm digging the new features and that bell power-up! The bunch of Kirbys is actually a keyholder. 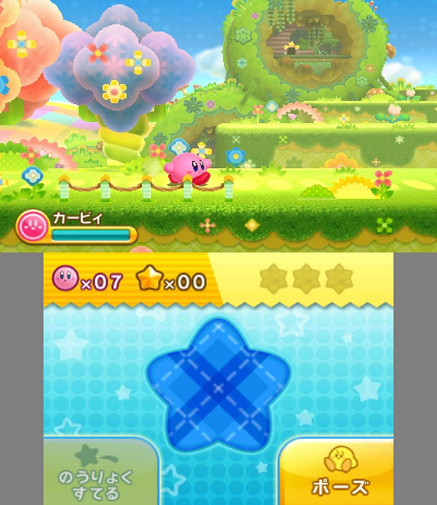 Over 250 keyholders are hidden throughout the levels that can be collected. 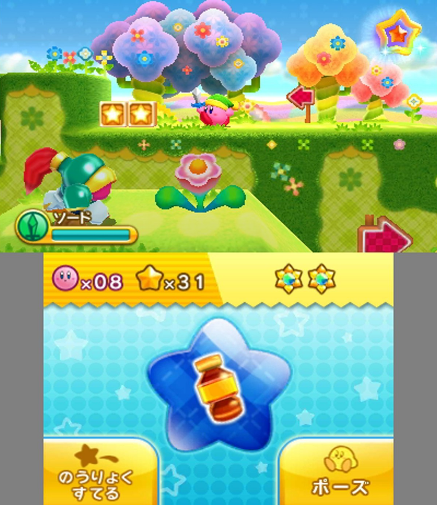 Various mini-games are also included. Did I just see a crowd of Kirby's? If I did, I will get it because I didn't have a chance to play Mass Attack. 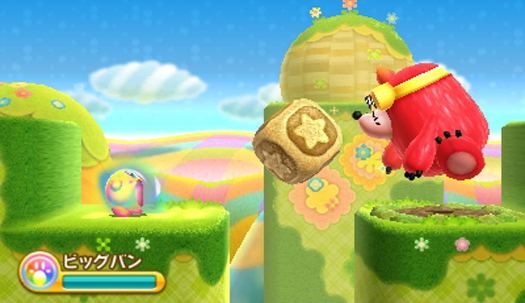 Another awesome looking game for the 3DS. Loved Kirby's Adventure Wii. Can't wait to play this one. Another great marketing move by Nintendo; I know I love my games announced two months ahead of time. 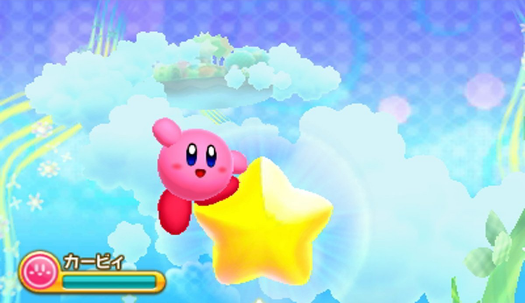 The new Kirby forms are awesome! 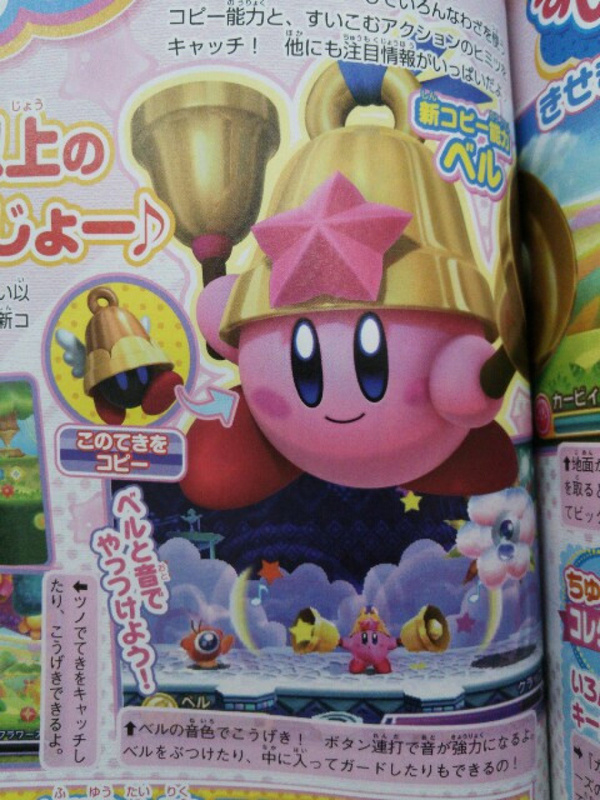 Bell and Beetle Kirby FTW! So exsited for this game! I'd love to see a 2.5D Mario game with the same basic graphic style, level of polish and attention to detail as these latest Kirby games have been getting. I would forgo both the New Super Mario Bros and Super Mario 3D World games for a Mario platformer that was basically more in tune with this game in terms of basic graphic/artistic design and layout, as well as the more traditional and imo always superior 2D gameplay and camera too, but just in the Mario universe. 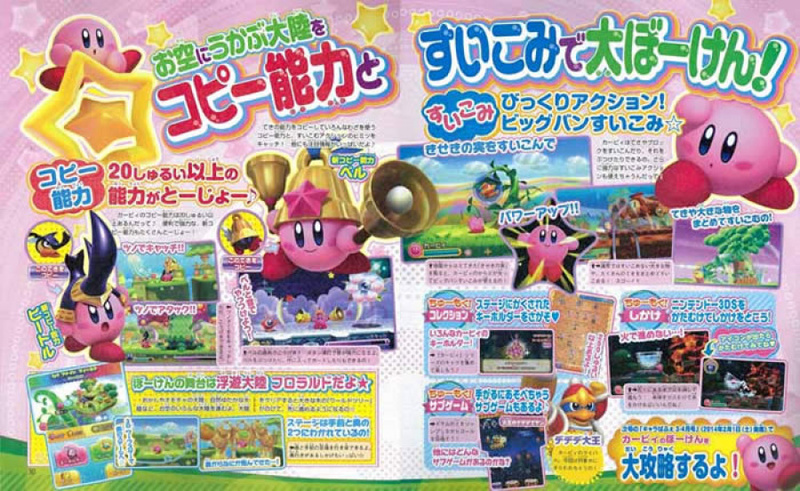 It is VERY clear to me that because Kirby is Iwata's baby that FAR more love and attention is being put into EVERY SINGLE ASPECT of these new Kirby games than any of the recent Mario games have seen. Every single area of these Kirby games just looks polished to almost near perfection (irrespective of whether you like Kirby's particular gameplay design or not). I'd love to see similar levels of all-round "holistic realization", if you even get what I mean, from a new Mario game for once because that's kind of exactly and indeed ALL that I think every single Mario game of late has been missing. So far this game is looking great by the way and although I've never actually been a big fan or traditional Kirby type gameplay I can certainly appreciate the highest level of quality, polish, execution and holistic realization when I see it. PLEASE DON'T MAKE THIS AS HARD AS MASS ATTACK HAL!!!! PLEASE!!!!!!!!!!!!!!!!!!!!!!!!!!!! January? Really? Nintendo really needs to do a better job of hyping stuff up for at least a few months. Not years, but months. X+Y did a really good job of reveal in Feb release in Oct. When they said they would. Mass Attack was really irritating, but did not sway my Kirby love. @Kirk i agree for the moste part + im a huge fan of Kirby lol and I mostly like 2D/Side scroll gameplay in moste game (Metroid Sonic ect) i have to admit thow i dont like the 2d mario games i never have tbh but often enjoy the 3D outings. That looks pretty darn good. Now if only it was due out over here in January, then it'd be out just in time for my birthday. Oh well, a Kirby game would be a rather weird way to mark a 21st birthday anyway. "holistic realization" is just a phrase I made up but it's about taking an idea or design element and making sure each part of it is fully realized in and of itself but also serves to enhance the whole experience too. I guess a better example of it not being quite "holistically realized" would actually be the levels themselves in Super Mario 3D World; where they just feel like these mostly quite simple obstacle courses randomly floating in mostly empty space save for an occasional background block or something. If these were properly realized levels imo then they would look like they were actual real living and breathing areas inside a proper "world" with the scenery going off into the far distance (regardless of the fact you couldn't get to those areas). This would just make the levels and indeed the whole world feel more real and indeed more epic and impressive, without taking away from what makes the levels so much fun to play through in any way. I want to feel like I'm actually playing inside a proper living and breathing Mushroom Kingdom that exists beyond the tiny little areas I'm currently playing in. That also ties back into the map stuff I mentioned above too. That giant, red mole enemy strangely resembles a Monty Mole from Super Mario quite a lot lol ..Major Burrows from Galaxy for that matter, what with the color and all. Yeah, the only real issue I had personally with Epic Yarn, which is one of my most loved games on Wii, is that is was so hard to basically fail that you never quite got that full sense of satisfaction from actually beating levels and overcoming the odds as you made your way through the epic adventure. So it took away some of the sense of personal achievement and satisfaction ultimately. Other than that though I actually think it was a near perfectly executed platform game in every way, area of design, and IF it had actually been possible to properly die and fail I personally think it would have been one of the best platform games of all time. It is still certainly one of the most brilliantly executed, highly polished and just pure fun and uplifting games I've played in many years and that is for sure. If only it actually had some real sense of danger and failure so there was that real sense of survival and success on the other side of that. Then it could have been one of the all time classics that could comfortably sit alongside such masterpieces as SMB3, SMW and Yoshi's Island etc. any news about us release date? 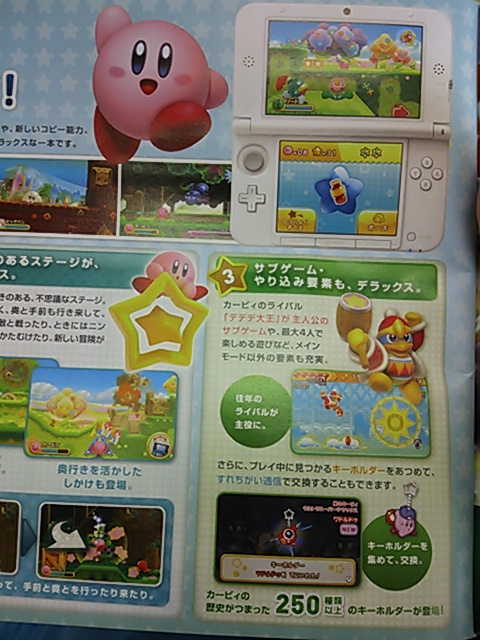 Umm how about a kirby on the WiiU hal? Seriously should have had one at launch. Everyone complains about Nintendo milking Mario, but I'm sick to death of Kirby. It's a mediocre platforming series with no difficulty meant for five-year-olds and those who love its pink-vomiting charm. @LUIGITORNADO what i dont get is if you hate something so mutch why even read / coment on a artical about it. @Volmun What a silly question...because I'm a fan of Nintendo, and I hate Kirby. Why else? This game looks beautiful! Hopefully it arrives in the inevitable 2014 drought. /what's the other power-up? Can't really tell what it is. 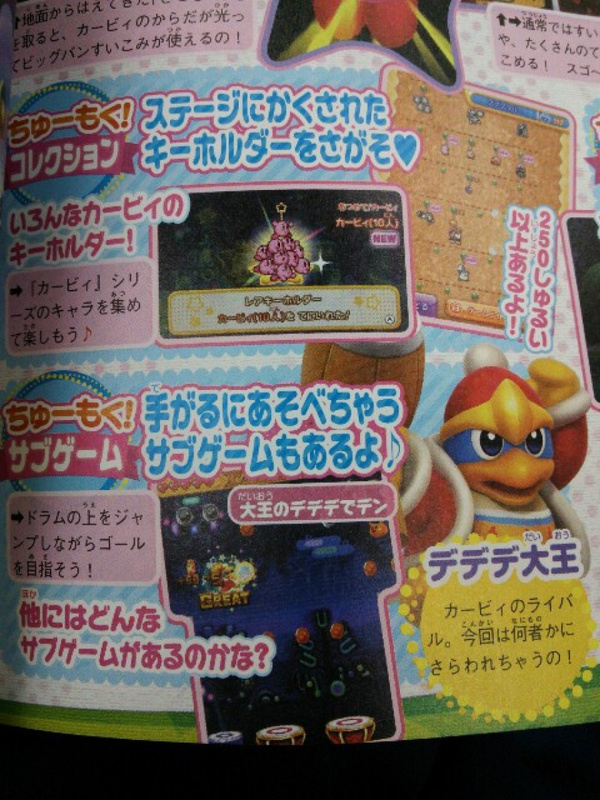 awesome i love kirby, and i am always happy when a new kirby game is coming! I have a good feeling about this one. Wish I could say the same for Yoshi's New Island. As a Kirby fan, I will be buying this game. But I have yet to see anything from this game that makes it anything more than a 3DS Return to Dreamland, which was fun for what it was, but it didn't really do anything Kirby hasn't already done. I hope to be proven wrong. Jesus F Christ, the 3DS is a freaking juggernaut of Nintendo franchises, really we already have Mario, Zelda, DKC, Kid Icarus, Pokemon, Starfox, SSB and soon Kirby and Yoshi, the only missing franchises would be Metroid and F-Zero and I think this console would be the first handheld to have all major franchises in it. Kirby to me, is what Mario is to everyone else. His games have been rocking lately, especially on Wii. But I'd much rather have this on the Wii U. In fact, I wish they'd take the devs who are going gangbusters on the 3DS, and put them on Wii U detail. have not purchased a Kirby game in awhile, but have been itching to and this one is definitely piquing my interest! And the 3DS game library just keeps getting better and better. I never said its a bad thing. Kicking back with Kirby at the end of the day sounds like a good idea I think, theres certainly much worse ways to end a birthday, right? I just find it funny that it comes out almost exactly on my birthday, just in the wrong country. Yo-yo kirby is back? Yess! My favorite powerup ever! 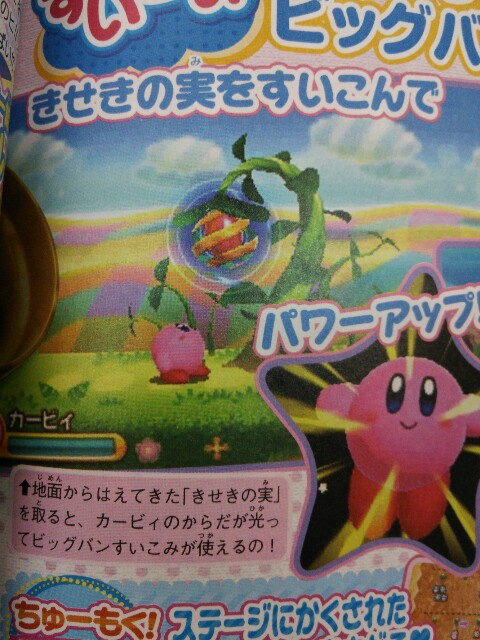 A 3d kirby shoot im down! Nice screenshots! Bell power-up could be fun! It's my favorite power-up too!